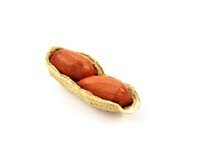 Make a snack of roasted, salted peanuts, or use them in homemade peanut butter, granola or other recipes. Though you can purchase peanuts already roasted, it is simple and often more economical to roast raw peanuts at home -- and you can add your own choice of seasonings to the peanuts. Using your oven, make freshly roasted peanuts in around 20 minutes. Spread shelled or unshelled peanuts in a single layer on the baking sheet. Place the baking tray in the oven and roast about 15 minutes for shelled peanuts or about 25 minutes for peanuts in the shell, until the peanuts are light brown. Stir the peanuts every 5 minutes. Remove the tray from the oven and sprinkle the peanuts with salt, if desired. Allow them to cool completely before eating. American Peanut Shellers Association: How Do I Roast Peanuts?